PG&E ISSUES FUEL ROD REPORT: The Pacific Gas and Electric Company announced Tuesday that it had issued a final report on nuclear fuel missing from its defunct Humboldt Bay Power Plant just south of Eureka. According to a company press release, the company is fairly sure that three missing fuel rod segments are still located in the plant's used-fuel pool. During the company's investigation, it came across several broken, shard-like bits of fuel rod in the pool; subsequent research led the company to believe that those shards were once the three missing segments. However, as nearly 40 years have passed since the segments were place in the pool, precise identification remains difficult, the company said. The company added that it is still possible that the missing segments may have been shipped off to a nuclear reprocessing center sometime in the late '60 or early `70s. BUFFETT LOOKING AT KLAMATH DAMS: It was widely reported last week that Berkshire Hathaway, legendary investor Warren Buffett's principal company, had struck a deal to buy PacifiCorps, a power company that owns several electricity-generating dams on the Klamath River, for $9.4 billion. The decision angered representatives of the Hoopa and Yurok tribes, among others, who had been lobbying the company's current parent, the U.K.-based ScottishPower, to remove its Klamath dams instead of going though an upcoming fight to get new operating licenses for them from the federal government. Tribal representatives traveled to Scotland last year to make their case, and received what they believed was a fair hearing. Now, in a statement released to the British press last week, the Hoopa and Yurok, along with the upstream Karuk and Klamath tribes, accuse ScottishPower of "selling them down the river." The tribes believe that removing the dams would likely go a long way toward improving the Klamath's water quality, and hence its ability to support large salmon runs. THOMPSON SEEKS RELIEF FOR FLEET: Meanwhile, Rep. Mike Thompson (D-St. Helena) and 36 other members of the House of Representatives' Democratic Caucus are pushing the federal government to declare this summer's salmon fishery a federal disaster, paving the way for economic assistance to local commercial fishermen. The request follows "unprecedented" restrictions on the commercial catch which were enacted by the Pacific Fishery Management Council last month. ASSISTED SUICIDE BILL TO ASSEMBLY FLOOR: Assemblymember Patty Berg's "California Compassionate Choices Act" -- a bill that would legalize physician-assisted suicide for the terminally ill under controlled circumstances -- cleared its final committee hurdle last week, after the Assembly Appropriations Committee on a vote of 11-6. The bill, which is modeled on legislation passed in Oregon in 1997, will be put to a vote of the full Assembly. If it passes, it will go to the state Senate and, if approved, to the governor's office. The appropriations committee's passage of the bill made national news last week. The CBS Evening News ran it as its lead story Wednesday, interviewing Berg and other advocates as well as opponents of the bill. "Californians want this right," Berg was quoted as saying in a companion story on the CBS website. "And whether of not there's the political will or the political courage to make it a right is yet to be seen." THE TWO-MINUTE MANAGER: "Maxxam Inc.'s annual shareholders meetings aren't what they used to be," wrote an anonymous reporter for the Reuters news service last week. According to the reporter the annual meeting of the Pacific Lumber Co.'s Houston-based parent corporation Wednesday lasted less than two minutes. When no one in the audience had any questions, Maxxam CEO abruptly adjourned the meeting, saying "I think everyone here knows what the company is all about," according to the reporter, who went on to reminisce over the days that protestors routinely interrupted the annual event. DESPITE THE ATTRACTIVE FRUIT BASKETS and complimentary cookies, the tension level hovered at the brink of discomfort last week at a public meeting to discuss the Pacific Lumber Co.'s upcoming watershed analyses for Bear River and the Lower Mattole. More than 60 people attended the meeting at the Mattole Grange in Petrolia last Thursday to hear a presentation of Palco's environmental objectives in the two watersheds, and to respond to the company's call for community input into a study of the area's river systems. Mike Miles, Palco program manager for watershed analysis, assured the audience that Palco is committed to the protection of fish habitat, as well as taking the public's concerns seriously. "You're going to be heard in our process, I can assure you of that," Miles said. "I'm going to try to deliver to you a very honest watershed analysis." Under the terms of the company's Habitat Conservation Plan, an environmental rider to the Headwaters Agreement, Palco must write a watershed analysis for each of the areas in which it operates, with an eye toward developing site-specific plans to maintain or improve aquatic habitat. The plan requires the company to hold public meetings to solicit information that could be useful in developing an analysis of each watershed. In past months, the company has held such meetings in the Elk River and Freshwater areas. The Mattole region has a long been a locus of resistance to Pacific Lumber operations, including tree sits, dozens of lawsuits and a high level of monitoring of Palco activity. Many residents are trained in forest management, habitat restoration, geology and other related scientific fields. Groups like the Mattole Restoration Council, the Mattole Salmon Group and Sanctuary Forest have been working since the `70s and `80s for preservation and restoration of the Mattole. In his opening presentation, Miles promised that many of the issues identified as serious problems in the rivers -- including erosion, sedimentation, poor water quality and high temperatures -- would receive serious consideration in the study of the two watersheds. However, more than a dozen people raised concerns during the public comment period that followed, including herbicide use, old growth retention, removal of riparian vegetation, the interaction between roads and livestock and a history of past Palco watershed analyses that drifted further and further from the public eye as they continued. "NCWAP was totally wrong," Roche said. "A lot of what they did was back-asswards." Despite such disagreements, according to some the Mattole meeting was a welcome change from previous public meetings for the Freshwater and Elk River watershed analyses. Richard Gienger, a restoration specialist with the Salmon and Steelhead Recovery Coalition, described a previous meeting as "an angry adversary scenario." "Everything was contentious," Gienger said. "It was nasty." Palco geologist Gary Simpson acknowledged some of the problems with past analyses. "In the past I think PL's watershed analyses have been incredibly expensive. They've been way too complex, they took way too long, they were way behind schedule, and I don't think they developed public trust," Simpson said. He added that using local scientists is part of Palco's conscious decision to be more transparent this time around. The Mattole audience was receptive, courteous and eager to believe Palco's promises of transparency, but many remained skeptical when the meeting was through. Ellen Taylor, member of the Lost Coast League, has been involved in several lawsuits against Palco. "The objective of watershed analysis is to generate profits for Maxxam," Taylor said. "It's our heath which is at stake when we talk about the removal of these large forests. It's our water quality and it's our livelihood." A 60-day public period of written identification of problems and priorities began the day after the meeting. Miles promised that a draft of the analyses, which covers some 78,000 acres in the two watersheds, would be available to the public as soon as it is finished. A dozen scientists from state and federal resource agencies including the California Department of Fish and Game, NOAA Fisheries and the North Coast Regional Water Quality Control Board were also present, and were also invited to take part in the process. JORDAN BAUMAN WORKS INTENTLY ON A PIECE OF leather in the art classroom at Arcata High School. Corrie O'Barr and several other young women steadily, if anxiously, cut fabric. Anne Bown-Crawford, Arcata Arts Institute director, looks on as Lara Cox, a mentor for the students, helps them create apparel. They are on a tight deadline: The first-ever Arcata Arts Institute Fashion Design Student Show is coming up, and soon. When the show starts, a year of effort by students in a unique program will come together in an extravaganza reminiscent of the fashion shows of France. It will feature a fall collection from three nascent designers -- Corrie O'Barr, Raechel Koepke and Becky Robles -- complete with runway and red carpet. There also will be student-designed jewelry and accessories. Sophisticated hors d'ouvres designed by chef Nick Crawford of Sunset Restaurant, who trained at the Cordon Bleu school in Paris, will accompany the art. The Fashion Design Show is just one of the year-end events being produced by the Arcata Arts Institute, which will soon be completing its first year. The concept began three years ago, when Arcata High applied for a grant to be used for an advanced arts program. The competition was rigorous -- 30 grants statewide were available. Then funding was halved. Arcata came out one of the final 15. The result is AAI, a school within a school. "It's unique because it's inside of a comprehensive high school," says Bown-Crawford. "It's not isolated -- a small charter school that's not big enough to have its own volleyball team, track team or AP Bio class. I have kids who came in from smaller schools or who were on their way out to smaller schools. We get to have the best of both worlds here." Each of the 68 students, some of whom transferred in from as far away as San Francisco, has an advisory team composed of an Arcata High teacher, a college level arts educator and, crucially, a practicing artist to mentor them in their field of interest and prepare them for the professional world. One condition of the grant was that all courses developed for AAI meet the academic standards of the University of California system. It's important to note, says Bown-Crawford, the students were involved in the planning process. "I told them from the beginning that the design of the school was as much theirs as it is mine; that they have to be in the mix. It took them a long time to believe that, because they're rarely handed this type of opportunity in a public school setting." The county-wide collaboration of educational institutions, artists, parents and students, creates AAI and is, as Bown-Crawford puts it, "a community school in the best sense of the word." 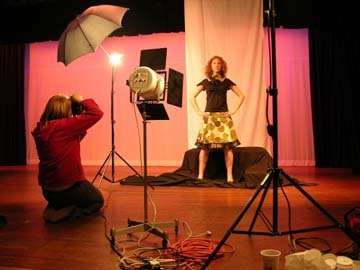 The institute offers media arts, musical arts, theater arts and visual arts. Each track presents a year-end event. So, where does fashion design come from? Bown-Crawford observes, "We had a bunch of visual arts students and they were doing some really cool illustrations and they were all kind of fashion-esque and we came to discover they really wanted to do fashion design." Curriculum is shaped by student interests. Key to the program is each mentor selected to work with the kids. Bown-Crawford worked with the Ink People, many of whose 600 artist-members have teaching credentials or experience with students. She also tapped her extensive knowledge of creative people in the community. "I try and create our stable of mentors based on what the kids' needs are . A group of girls came in interested in fashion design. I asked them if they could sew. Not one of them could sew." Bown-Crawford brought in Lara Cox, former owner of the retail fashion store Lola to teach them sewing basics. Design came later. Heather Ross of Munki Munki, a children's clothing manufacturer, joined the project, bringing her own sewing and design experience. One challenge they faced was that the grant did not completely cover materials or equipment. Bown-Crawford tracked down 13 sewing machines that were left over after the Arcata High home economics department was shut down. "[At first] we didn't have an iron, no scissors, no cutters," Ross says. "We were using each other as live mannequins. Everyone has little dots on their shoulders from being stuck with the pins." Ingenuity and community generosity came through. Watching creativity flower inspires the mentors. One of many moments that Ross remembers is Corrie O'Barr's epiphany. "She was making a tweed jacket a pretty complicated pattern." The only mirror was in a cabinet and it could only be seen when the doors were open. Corrie put on her coat and opened the door. It was the first time she'd seen it. "She just freaked out. She couldn't believe that she'd actually constructed a sleeve that fit really well, based on math and a sketch," Ross said. Students learn other skills. Jordan Bauman, producer of the show, is learning event management. She's also photographing, mentored by the Ferndale photographer Robin Robin, who has shot Prêt à Porter (the "Ready to Wear" show) in Paris. Additionally, her handbag designs, including a banana bag, will be featured. "I tend to bite off more than I can chew," Jordan says, her eyes big and restless. Just as the larger community collaborates to make AAI possible, the students will collaborate to create the signature event. Lights, camera, food and finery will come together. Corrie's face lights up, "Seeing the models with the clothes on It's really happening!" Top: Photo by Stilson Snow. 3rd: Becky Robles. Photo by Robin Robin. Bottom: Jessica Lilly. Photo by Robin Robin.